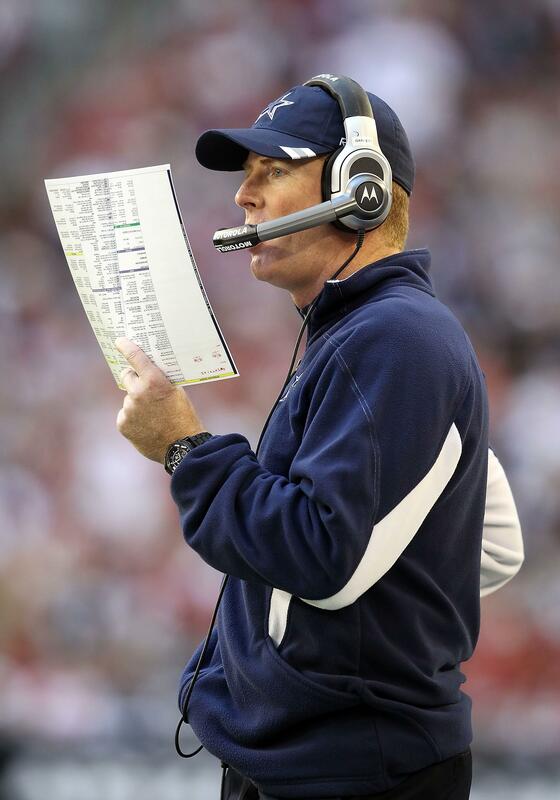 Cowboys coach Jason Garrett during Dallas’ game against the Arizona Cardinals. Photo by Christian Petersen/Getty Images. Here is a list of miracles, and maybe you can spot the one that can be explained rationally: water into wine, raising of the dead, a Vikings rookie quarterback underthrowing a receiver deep in his own territory with 90 seconds remaining in a tie game. It doesn’t take a theologian to know that sometimes breaks go your way, sometimes for multiple games in a row. No, there was a real Feast of St. Barbara miracle yesterday. For only the second time in 191 NFL games this year, a game went to overtime and the team that won the coin toss marched down the field for the winning score. In all, including Sunday’s Cardinals win over the Cowboys, teams that have won the overtime coin flip are just 3-6 on the year. Maybe that’s no grand sample size—not that Tebow’s CV is much longer—but it’s a far cry from long-accepted NFL wisdom that if you get the ball in OT, you’re probably going to win. The percentage of teams winning the toss and then winning the game has always hovered around 60, until this year. What’s changed? It’s not much of a stretch to posit that the NFL’s new kickoff rules are coming into play. Football has always been at heart a battle of field position, never more so than in the extra frame when all you need to win are three first downs and a field goal. As field position changes, so does overtime. Moving kickoffs up five yards to the 35 was expected to cut back on the number of touchdown returns, and it has: just eight so far this season, compared with 16 at the same point last year. When sudden death is in play, it’s more important to look at the increase in touchbacks. At this point last year, 18.8 percent of kickoffs resulted in kneeldowns. That’s skyrocketed to 45 percent in 2011. This matters a lot, as it turns out. Average starting field position is now the 22.1-yard line. (In the nine overtime games this year, it’s the 21.3.) That’s down just four yards from last year, but that’s misleading. When you remove touchbacks from the numbers, as Advanced NFL Stats did a few years ago, the average starting position was the 32—a full first down better than teams are getting now. What does 10 yards mean on any given drive? According to Advanced NFL Stats, teams convert a first down two-thirds of the time, so a touchback turns a field-goal drive into a punt 33 percent of the time. If there’s a lesson here for coaches and return men, it’s that being conservative doesn’t work in a winner-take-all overtime. Of the six teams to win the toss and lose the game, just one of them returned the kick—the Rams had no choice, having fielded the ball at the 2-yard line—even though only one of those kicks sailed out the back of the end zone. Conversely, of the three teams to win the toss and go on to score first, just one—the Cardinals on Sunday—settled for a touchback. And they had no choice: Dan Bailey boomed it beyond the end zone. But conservatism will always be the bane of head coaches, who are to a man convinced that they can hide from bad press and angry owners by doing the bare minimum. If Norv Turner and Jason Garrett weren’t so content to play for long field goals, that win-the-toss/win-the-game club would be even more exclusive. The only member: the Lions, who beat the Vikings in overtime back in Week 3. When the NFL instituted special overtime rules for the playoffs before the 2010 season, the aim was clear: to make sure a Super Bowl didn’t end with a team winning a coin flip, gaining 30 yards, and kicking a field goal without the other team getting a chance to touch the ball. Perhaps they needn’t have bothered. The new kickoff rules have inadvertently given both teams a shot, and maybe even gone too far in the other direction. Might we soon see a team win the overtime toss and choose to kick off?